Development - Raleigh Housing Authority. The Raleigh Housing Authority’s Development Department is funded through the Capital Fund Program. The department’s mission is to maintain and modernize 1,400+ public housing units. Development also handles real estate transactions related to agency interests: including, acquisition, deposition, and land use lease agreements. Working with Capitol Area Developments, Inc., a non-profit entity of the housing authority, the department also helped redevelop four outdated public housing projects (Halifax Court, Dandridge Downs, Chavis Heights, and Walnut Terrace). The primary function of the department is to facilitate improvements on interiors and exteriors of the public housing units. A physical needs assessment is formulated based on information gathered from residents and staff. As this process evolves, a five-year plan is developed and these items are then implemented in the agency plan. The department manages ongoing capital improvement projects: including, kitchen and bathroom restoration (cabinets and floors), 504 (handicap) compliance, site improvements (paving and landscaping projects), vinyl siding installation, and replacement of entry doors, screen doors, ranges and refrigerators. Whenever possible, products that minimize maintenance needs (i.e. vinyl siding, gutter guards, and sheet vinyl floor coverings) are used. Development works closely with the RHA Maintenance Department staff to ensure the products used are in compliance with the standardization conversion that has been implemented. Development, working with Capitol Area Developments, Inc., was instrumental in the revitalization of Dandridge Downs. This one hundred-unit apartment complex no longer provided a suitable living environment for public housing. After demolition, the land was used to create Biltmore Village, a thirty-one home subdivision. All of these affordable, single family homes were sold. 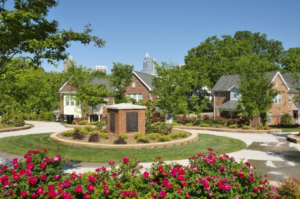 Biltmore Village has become a vibrant neighborhood and a positive addition to southeast Raleigh. In 1999, RHA received a HOPE VI Grant to demolish and revitalize Raleigh’s oldest public housing complex at the time – Halifax Court. This award-winning revitalization was completed in 2003. Renamed Capitol Park, this mixed-use, mixed-income site features a mixture of public housing (60 units), affordable (59 units), and tax credit (90) units in a variety of housing types including townhomes, single family homes, villa-style apartments, and a senior living center. In addition, a park, a community center, a daycare, RHA’s central office building, and a City of Raleigh Parks & Recreation facility are part of the Capitol Park community. Capitol Park is an incentive housing program for working families site. The public housing residents at Capitol Park consistently maintain a 100% employment rate. It is also important to note that this site has become a catalyst for revitalization in the surrounding community spurring the growth of Peace College, the construction of the Seaboard Warehouse shops and restaurants, the revitalization of Pilot Mill, and the renaissance of the Pilot Mill Village with the construction of over 100 high end single family homes. In 2004, RHA received its second HOPE VI Revitalization Grant – this time for the revitalization of Chavis Heights. 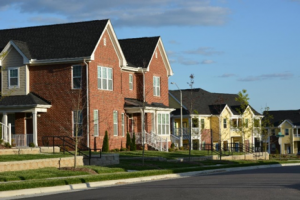 Modeled after the successful revitalization of Halifax Court, Chavis Heights features a mixture of public housing (86 units), affordable (27 units), and tax credit (50) units in a variety of housing types including townhomes, villa-style apartments, and a senior living center. Chavis Heights also has a community center, and park for its residents. In 2009, Walnut Terrace was Raleigh’s last remaining barracks-style traditional public housing complex. With the HOPE VI Revitalization program coming to an end, RHA decided to implement a truly local revitalization effort. 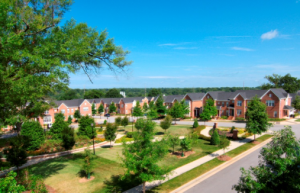 Funded with Capitol Area Development, Inc.’s (CAD) and RHA’s own resources, RHA and CAD’s plan replaced the 300 barracks-style units with a 292-unit mixed-income community. With 218 one-bedroom villas, 55 two-bedroom townhomes, and 19 three-bedroom single family homes, the site provides new affordable housing options for 292 families in downtown Raleigh. Like Capitol Park and Chavis Heights, the development incorporates a mix of public housing owned by RHA and affordable market-rate units owned by CAD, Inc. In addition, the new Walnut Terrace community features a park, community center, and a maintenance facility. The property opened in February 2015 and was fully leased by July 31, 2015.